WARNING -- spicy (but delicious) food ahead! On Burbank Blvd. in Burbank, CA is Chili John's as seen on Diners Drive-Ins and Dives with Guy Fieri. You can't miss it right on the corner with a big sign. You walk in and there's only counter seating, and the counter is a big horseshoe around vats of chili and dogs. We went last night, and the owner greeted us in a very friendly manner despite arriving near to closing time. He asked us if we had been there before (we hadn't), so he explained how it works: there's beef chili and also chicken and vegetarian chilis, and they are medium or hot. 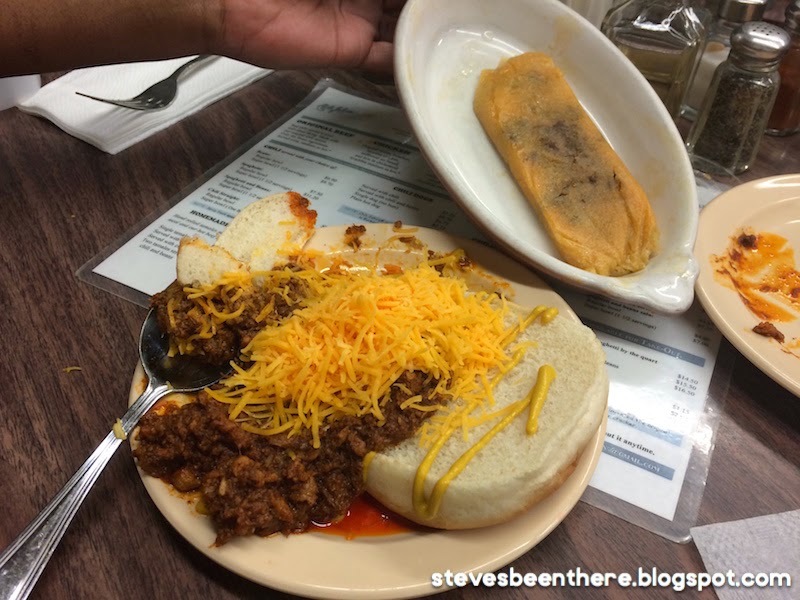 You can get the chili alone, or over spaghetti noodles, or over a hamburger bun (Sloppy Joe style). Or a chili dog. And add all the cheddar cheese or chopped onions you like. We weren't sure how hot we wanted our chili, so he offered us a sample of the beef and chicken. If you like spicy food, this is the place for you. If you are not able to eat spicy food, be sure to get a sample to make sure you can take the heat. The heat of the food reminded me of Prince's Hot Chicken in Nashville because it's very hot, and oily too. 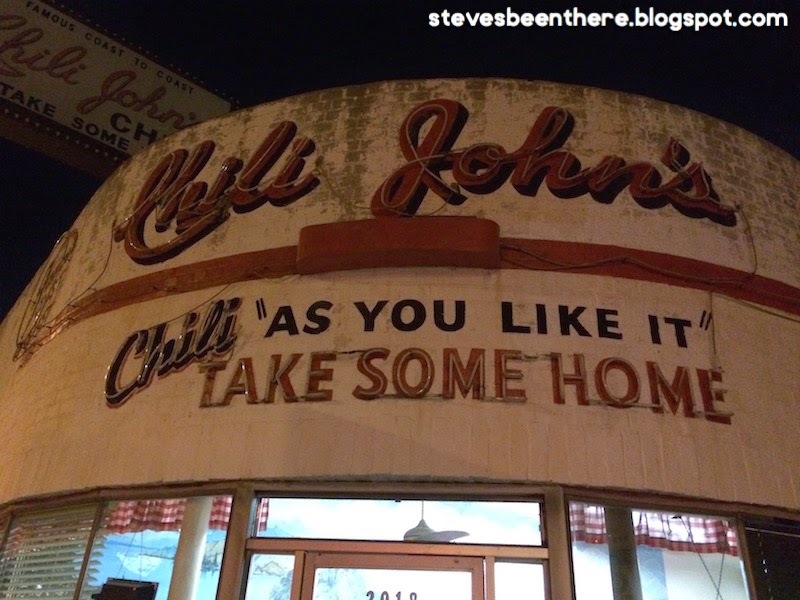 So we got beef chili over noodles, and chicken chili over a bun which he calls a Sloppy John. And a beef chili tamale to round it off. There's no beans unless you ask for them. Both chilis were really tasty, and very meaty. These are thick, hearty chilis with a lot of meat (and heat). And like I said, no beans. He offered us some apple vinegar which tasted really good sprinkled over the chili. So I liked this place a lot, the owner is super friendly, the atmosphere is great, and the chili is awesome (but very hot). The owner bought the place a few years ago from the previous owner, and they claim to have been around over a hundred years. And the t-shirts are a great deal at $11! I always like it when a foodie place doesn't rip you off on the shirts and hats. What's the spiciest chili you've ever had? Let me know in the comments below. 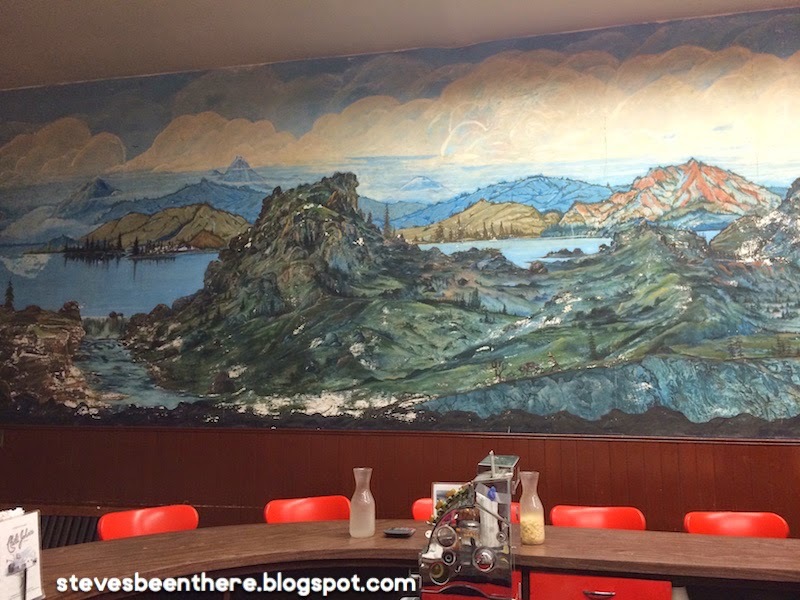 For another review and more pictures, check out the review on Diners, Drive-Ins and Dives Adventures blog.